The DHHM was first staged in 2016 after a year of trying to find someone who could demonstrate optimism, gullibility and a misguided absence of fear in equal measure to volunteer to be race organiser. Our tentative dipping of toes into the Doynton countryside in 2016 was such fun that we did it again in 2017 and 2018 and we had an amazing time. Marshals, runners and locals all felt the love and dedication we invested and your feedback was wonderful - have a look at our ' say what' page. We made some further improvements for DHHM2018 and had a third sell out as well as a thorough wash-out in some very challenging conditions (we didn't realise it could rain that much for that long!). Well let's be honest: it's pretty tough but it is fun! 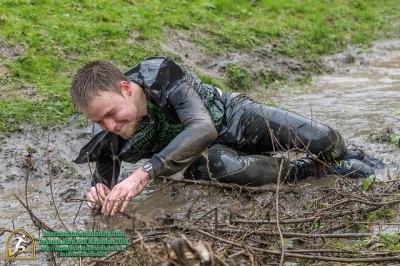 It's hilariously hilly and marvellously muddy, it will probably be quite cold (it's in January), the scenery is terrific and the terrain varies wildly. We just love it! The Doynton Hard Half Marathon is a tough cross-country half marathon (approximately*). It mostly takes place on public footpaths, bridle paths, and country lanes thick with mud and other sticky things that occur naturally in the countryside. Through rivers swollen with winter rain and over hills with hellish climbs and wicked descents. In fields, forests, farm tracks and forgotten footpaths. Add in old bridges, a quarry, a churchyard, a secret glade (at least it was a secret until DHHM2016) topped off with some magnificent views and you’ll understand why we love our race. The Doynton Hard Half Marathon is a chip timed and very generously signed & marshalled race. Friendly faces will guide you to a goodly sized free car park and a fleet of buses will transport you to Doynton and race HQ, a 3 minute journey away. 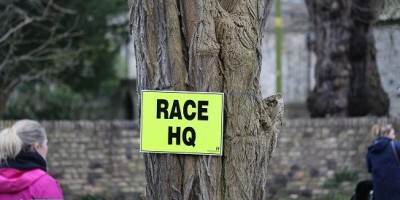 Race HQ is in the cricket club for DHHM2019 and bag storage facilities are right on the doorstep so no inconvenient post-run excursions will be necessary to retrieve your winter woolies. Our team of hi-vis marshals will efficiently guide you around the course and the village and will usher you to collect your technical t-shirt and goody bag. They will then direct you to the cake stall for some post-run energy (so keep some loose change in your pocket to spend afterwards).